Thanks for your support on FUJITV service. 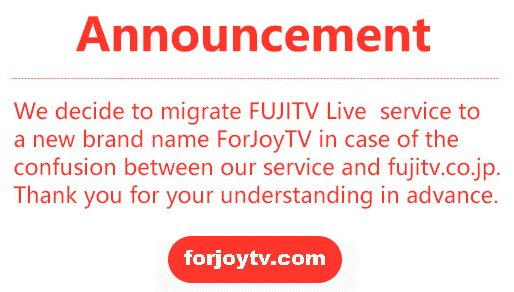 We decide to migrate FUJITV Live service to a new brand name in case of the confusion between our service and fujitv.co.jp. Thank you for your understanding in advance. The service and all the functions of the software are still same as the original. Once we start migrating to the new brand, the update notice will be popped up when you watch TV. It will auto update to the new brand ForJoyTV application. We will continue offering the stable service for you. Thanks again for your continued support. (https://itunes.apple.com/app/fjplayertv/id1366817063) and begin watching japan TV live on iPad/iPhone/iPod Touch. FJPlayerTV app is available at Apple App Store.